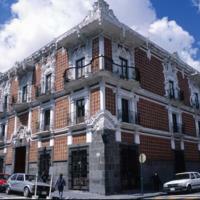 This house in Puebla shows the distinct architectural style that developed in the city. Always second in rank and size to Mexico City, Puebla celebrated its reputation as the most “Spanish” city in New Spain. Since it was not built on top of a pre-existing indigenous city, its early residents were largely Spaniards, and its indigenous workforce lived outside the city in the many surrounding indigenous towns. ; Puebla was a center of production for the famous talavera poblana ceramics, and its wealthy residents used ceramics to decorate the outside of their homes, as well as their interiors, creating an architectural style that was unique in New Spain. 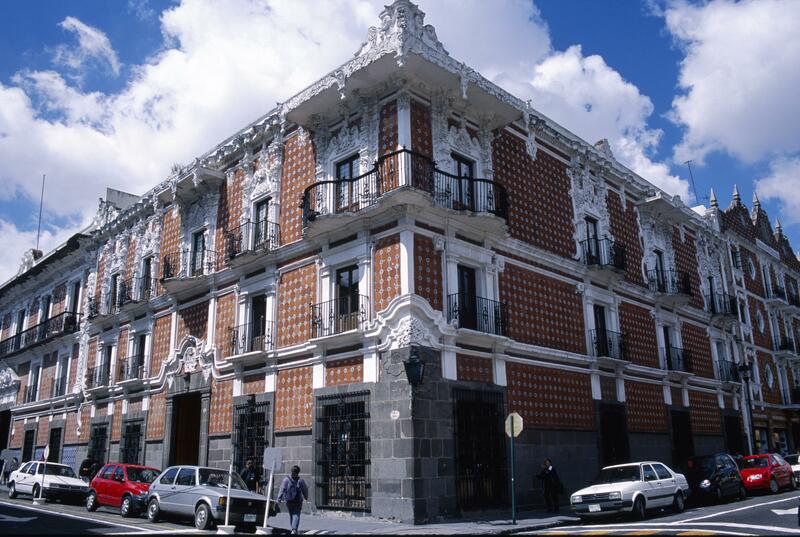 The uplifting entablature, echoed in the roof line, is typical of Puebla architecture of the period. The house’s name, alfeñique, comes from a kind of marzipan candy that can be easily worked into fanciful shapes. The plasterwork on the outside, painted white, is exuberantly molded. On the exterior walls, the combination of brick and blue-and-white tile, set in decorative patterns, was favored by the builders of Puebla’s 18th century mansions and parish churches. This combination had a long history in Spain, which absorbed Islamic traditions of tiles, but was normally used there as flooring. The glazed tiles were the product of one of Puebla’s many ceramic workshops. The vessels and tiles from these workshops were exported throughout Spanish America. The architect has included estípitecolumns—in the shape of two elongated pyramids, one upright, the other upside-down—that were the rage in 18th century buildings of New Spain. They are also found on the façade of the Sagrario in Mexico City and in Mexico City's Altar de los Reyes. On the ground floor, the entries were originally doors leading to separate shops that were rented out to artisans. The mix of commercial and domestic spaces was typical in Spanish American cities. The patron of the house was Ignacio Morales, a wealthy ironworker, who commissioned the structure in the last decades of the 18th century. The architect, Antonio de Santa María Incháurregui, fulfilled a number of major commissions in Puebla. The building has been restored and now houses a regional museum. While many features of this house can be found in other elegant 18th-century homes in New Spain, the style of the architecture was typical of only Puebla. Today, the Casa de Alfeñique suggests how local tastes and styles took form in distinct communities and towns in Spanish America, even as elites shared many cultural practices. Gavin, Robin F., Donna Pierce, Alfonso Pleguezuelo, eds. 2003. Cerámica y Cultura: The Story of Spanish and Mexican Mayólica. Albuquerque: University of New Mexico Press. Ibáñez Guadalajara, Rafael. 1949. La arquitectura colonial en Puebla. Puebla: Talleres de la Revista "Mignon." Sánchez Hernández, Andrés Armando. 2006. Casa de Alfeñique. Puebla: Benemérita Universidad Autónoma de Puebla.